Today it begins. A year-long art doll round robin called 'Art Doll Cool-a-beration 2009'. I am very honoured to be a part of it! Above you see a picture of my 'nekkid' doll whose name is Shudayra. Right now she is having a grand time visiting in Moose Jaw and from there she will be visiting seven places in the US before returning home to me. I only wish I could travel along with her because I would love to meet the other artisits in person. Just think of the fun we'd have! However, I shall have to content myself with having their dolls visit me. This is a somewhat different type of RR because we are allowed to post pictures as we work. It will just add to the fun and anticipation of receiving each doll! The dolls are accompanied by an art journal which we will also be adding to as well. Yesterday I updated my sidebar to include the other artists taking part in the Coolaberation, so please feel free to drop in on them and say hello. I have joined a pretty talented group!! Thank you so very much for giving me your input and critiques and solid suggestions about the piece I posted in the last entry! I am so grateful for all your support. There are very few mixed media artists in this area, so it's hard to get an honest critique. I knew you'd all have something to say and I was happy to hear it! Now it's on to the next piece that I have in mind (amazing what you can come up with whilst in the shower). You'll be asked for opinions on that one too. (Someone asked the size of the last piece...approx. 10x13"). The picture today is of a little music box I picked up at the thrift store. I picked it up thinking it was a cute little sewing machine and was delighted when I discovered it had a music box inside AND it worked!! It's about 6 inches high and cost me all of $3.49! Ok folks, here's the mystery (to both you AND me!) project which is, I think, finished? As Arlee said, I am poised on the ledge of artswomanship (no such word, I know). Am I about to leap off or am I still clinging by my toenails? (Picture is clickable). We had a fabulous day at our friends' cottage yesterday. The weather was perfect (for once it didn't rain when we were up there). Their place fronts onto a small lake, but otherwise is pretty much surrounded by woods. We were very blessed to have a wild deer grazing on their property and walked right up to us - close enough we could have touched her. And guess what? I'm an idiot and forgot my camera! Yeah, I know...dumb. It was a huge thrill. I really don't know how people can hunt them for so-called 'sport'. Flowers - of another sort! Today was our monthly CQteers meeting and, as usual, we had fun. Sue taught us a really pretty watercolour technique and my efforts are in the above picture. I will certainly play with this again! (thanks Sue). The below picture is the atcs we exchanged (on a 'Recycling' theme). The one on the right is by Sue; upper middle is by Irene; lower middle by Kym' and the two on the left are mine. The 'red' one is the true recycling one...made from newspaper and a bit of red paper I had in my scrap pile. The title is....wait for it.....'Black and White and Read all over'. SO original!! The other one was simply a personal challenge to make something out of 'stuff' I had dwelling on my worktable. Tomorrow there is not likely going to be a post. We've been invited to a cottage for the day so I doubt I'll have time to be on the computer. Do feel free to talk amongst yourselves!! This is not only a mystery to you, but it's a total mystery to me as to what I'm heading for with this piece. I worked on it today while a couple of friends were here and have to admit that I think I'm liking it. However, the big question is...what on earth am I doing and what am I going to DO with it. Will it be a journal cover, a piece of 'stuff' for a wall someplace, or will it reside in the bottom of a drawer someplace. Only time will tell. More from the garden...peonies this time. We had a busy weekend, with a lot of it being spent in the car. Thursday we went to Toronto to pick up #2 son and his GF (he was a groomsman in a wedding this weekend, so had to come home in order to do the 'duty' things on Friday before the wedding on Saturday). Friday we took a friend to a medical appointment, also in Toronto, and then picked up #1 son while we were there. Sunday we got in the car again and toured up to Bobcaygeon where the bestest (and hugest!!) ice cream cones can be had. Out for supper with my dad that night before we headed back to the city to return the offspring. Phew! No wonder I haven't had time to do any posting!! Obviously not much was accomplished on the creative front either. Pictures today and yet more oriental poppies (I love them, so you're just going to have to put up with pictures!!). The bottom picture shows part of the view from the back of our property. The gardens are absolutely gorgeous right now. Sorry folks, but today was one of those spinning wheel days where nothing got accomplished on my art. We have one or both boys coming home for the weekend, so posting might be sketchy for a few days. Just thought I'd give you fair warning! 1. Susan Lenz of Art in Stitches is doing some fantastic stained glass in fibre, which you just have to see! 2. There are dolls to see here, and here and some more here. 3. I stumbled across this site a couple of days ago. If you are the least bit concerned about the hazards contained in the potions and lotions we use on our bodies, just have a look at this site. Plug in a product you use to see how it rates. I know I was surprised about a few I've been using! 4. If you like peeking into studios, check out the entries here. (Thanks Arlee for this one). 5. And, if you're interested in a crap shoot (because I have NO clue why I wrote this down, along with a happy face alongside it), then go here. There, hopefully those will keep you busy until I can a chance back at the blog! I'm not quite sure where this piece is heading, or even if it will progress into anything worth showing anywhere. There will be hand stitching on it and maybe a face (or then again, maybe not). I'm trying very hard not to be a perfectionist with this and letting things be crooked and fuzzy and out-of-balance. Some things are from my component box (thank you Arlee!) and some from my stash. I want an excuse to make some more rusted fabric this summer and I really can't justify it if I haven't done anything with what I made LAST year!! I wait every year until these come into bloom! They are my absolute favourites of all the ones we have in our garden. I love single poppies of any variety, but these are just so spectacular!! When DH and I had our sanity day last week, we found a delightful painting of poppies and spoiled ourselves (well, me actually...he doesn't care what's on the walls!). It's residing under the bed until our 30th anniversary in the fall OR until the bedroom gets repainted, whichever comes first. I can pretty much guarantee the anniversary will happen before the painting! Of course my camera needed recharging or I could have taken a better photo of this! However...this afternoon that big yellow 'thing' demolished the house across the street. It took less than an hour until it was completely flattened. We've been suspicious since the house became empty about three years ago that it was a grow op and now that has been confirmed. Nice to have it (and the perps!) gone, but still a shame to see a lovely old two story house have to come down. These are just a few of the flowers currently blooming in our garden. These are such low maintenance and give so much beauty. So far even the earwigs haven't decided they're tasty enough to eat. We used to have some lilies too, but there's some sort of beetle that cleans them right off. With the current law here in Ontario, we are not allowed to use any sort of pesticides so what flowers we have need to be able to fend for themselves. I know, I know...it looks disgusting doesn't it. However, in my defence, the picture isn't doing it justice. On one of my groups this technique came up in conversation and, because a friend was here for the day, we thought we'd have a go. Layer 2 - torn bits of masking tape stuck down randomly all over the fabric (being sure to ultimately cover it all with tape). We decided at this point it would be wise to use a brayer to ensure all the tape was well adhered. Layer 3 - we used a water base wood stain in Dark Walnut (Liquitex Acryclic Wood Stain) which we brushed on fairly thickly. We let it sit for about a minute before we blotted it with a sop cloth until it reached the look we wanted. (Initially I wiped the stain off, but the effect wasn't realistic enough so I reapplied the stain and blotted it off). Layer 4 - after it dried, we used water base varnish to seal it. Great fun, easy, and best of all...cheap, cheap, cheap!! Sorry folks, no pictures today. Too dull outside to take any and what's happening in my studio is just as dull!! I actually have one whole year of the old diary typed up (it took 20 pages of typing, averaging about an hour & a half each). 29 more years to go. 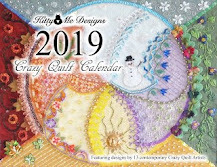 Random Item # 1 - If you like crochet, or want to be blown away by what they're doing with freeform crochet, please check out this. Having a look at all the pieces will keep you busy for awhile! Thanks to Sharon B for the link. Random Item #2 - One of the members of my art doll group has recently set up a space to sell some of her creations. Several of them are on my 'covet' list! Check out Karma's site. Random Item #3 - Here's a couple of doll sites I've stumbled upon: BlackEyedSuzie and LoopyBoopy. Random Item #4 - Spent the afternoon with a good friend. No work got done, but we had fun talking about anything and everything. Found out that her husband is a descendant of the family where Black Creek Pioneer Village in Toronto is situated. The family donated a ton of historical artifacts to the Village. We have a road trip planned! Random Item #5 - If anybody is interested in seeing more of the quilts from our local quilt show, there is a video on their blog. There, I guess that's enough randomness for one day! The tree peony is in bloom! We planted this last year and have had our fingers crossed that it might bloom this year. Here is the very first flower (and there are more to come). We wanted a red one, but pink will do just fine! Today Jack and I had a 'sanity' day whereby we just get in the car and go where the whim takes us. We've had a rash of thefts in our neighbourhood and have managed to lose over half of the new solar lights we had just purchased for our front yard. So...we got an on at dark, off at dawn attachment for our porch light today and hopefully that will save what's left of our solars once we move them into the back yard. However, NOW the rotters will be sure to see my three planters that are out there...can't win! Jack was nice enough (or foolish enough, depending on your point of view) to let me stop at the bookstore and I managed to wander out with new new Somerset art quilting magazine, the new Sew Somerset AND the Cloth Paper Scissors Studio magazine. Sigh. I have NO will power. None. Zip. Zilch. I had promised myself most severely that I would ONLY ever buy the Sew Somerset and leave all the rest of them alone (other than maybe one Art Doll 1/4ly occasionally). 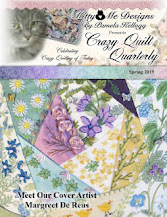 However, how can I resist buying the art quilting one when there's a lovely article in there about Jude (who, by the way, is one of my worship-from-afar people)? AND, it's the first they've published and it's SURE to become a collectors item (isn't it??). As for the Studio magazine....well....it isn't half as expensive as the Somerset equivalent....no, I guess that's not a good excuse is it. Well, it's all Jack's fault for taking me in there in the first place!!!! Doll group and a drawing! I don't normally post on the weekends, but there are a couple of things I'd like to tell you about. 1. There is a new art doll-making group starting up on yahoo which is promising to be VERY good. You might want to check it out and join up for all the fun. They will be having different challenges and swaps and will be sharing lots of tips and techniques and just generally having a good time discussing and showing our dolls. http://groups.yahoo.com/group/Decidedly_Different_Dolls or, if you can't find it that way, just do a yahoo search for Decidedly Different Dolls. As an offshoot of the group, there will be a blog as well where there will be lots of tutorials and techniques being shared. Come join us! 2. If you happen to like hand dyed and painted fabrics, please check out the current post at Vicki Welsh's blog (Field Trips In Fiber) . She has opened a new Etsy shop where she is selling some drop-dead gorgeous fabrics and some pretty spectacular tie dyed items. She's also holding a draw on her blog for a piece of her fabric. Great stuff!! Quilt Show - final installment! Above is one of the jackets that caught my eye. Of course they weren't made from denim so they weren't my style, but pretty anyway. These two pictures struck me as being the closest to being art quilts and were quite eye catching. Finally, this doll. Although I'm no longer a member of the quilt guild, this doll is one I made for one of my friends who is a member and she put it on display in one of the antiques they had for atmosphere. The pattern is from an old one my mother made for me when I was little. I found the pattern in her stash when she passed away. There...all done. Now it will go back to your regularly scheduled drivel. Hope you enjoyed the show! Quilt Show - part five!! I promise, only one more day after this!! I thought I'd do two posts today so I could get through this week. I don't want to bore you totally to tears!! This set of pictures show some of the ones I particularly liked the colours of. Here are some more of the lovely quilts. There were a number of nice bargello ones. It seems that bargello is making a comeback, at least in quilting. Perhaps it will return in needlework too? There were also a number of black and white entries. This one caught my eye. A sampler quilt, in my favourite colour! This one was intriguing. It's some sort of stack and whack, but a very different application. Part four is on the way tomorrow (hope you're not getting bored!!). Here are more of the lovely quilts. I really liked the leaf one (seen above). It was very subtle, but also very striking. Unfortunately I couldn't step back far enough to get a better picture. This one was also spectacular. A lovely log cabin, but with a twist. I could not get a good focus on this one, but I loved the painted trilliums, surrounded by the green just like you'd see in the forest. This is a crazy log cabin and I fell in love with this pattern. I really would love to make one, provided, of course, I could embellish the seams with embroidery! This quilt-covered car greeted us outside the door and set a nice tone for what was to come inside! Of course I had to take a picture of the one and only crazy quilt in the whole show!! This one is a particularly lovely example. If you click on any of these pictures they will embiggen and you can see the details (and, hopefully, be able to read the history of this quilt).